This model is highly compatible with social work practice values and a great fit with social workers’ skill sets. Older adults overwhelmingly state that they want to age in place in their homes and communities, according to statistics presented by AARP in 2010. Although many people will age and need little support to remain in their community, the risk of chronic health and functional impairments certainly increases as one grows older. The Older Americans Act of 1965 was intended to address the long term care needs of older adults and provide opportunities to remain meaningfully engaged in community life as one ages. However, gaps and fragmentation in long term services leave many without adequate support to remain independent. This traditional system has emphasized a social planning approach, with minimal input from older adults or community members regarding the design and delivery of services (Rothman, 1995). Although several community-based support models have arisen, the Village model typically relies on an informal network of community members to provide assistance to aging populations within a specific geographic area. Although Villages can and have developed through existing social service agencies that use formal services, this article focuses on the grassroots, consumer-driven, volunteer-first model that is most prominent in the Village movement. The volunteer-first model is initiated by community residents who have identified their desire to age in place, experienced the challenges of aging, and want to establish a self-governed organization that assists in addressing these challenges. Villages are formed and governed by residents of a community who design the program of assistance to respond to the community’s expressed needs. Typically they are membership-based nonprofits with an annual fee. Many of the organization’s leaders, including board members, are members themselves, and they actively solicit the participation of members in the development and evaluation of the initiative. According to the Village To Village Network, there currently are nearly 100 fully operational Villages in the United States, with another 149 in development. Volunteer-first Village staff members are responsible for the administration of the program (i.e., vetting, training, and managing volunteers) and, in some Villages, provide care management. In some cases, professional services are accessed through vetted vendor lists, including home healthcare and professional home repairs. However, volunteers remain the backbone of the model, providing services such as transportation, shopping, household chores, gardening, and light home maintenance. The Village focuses on the traditional concept of community as a geographically based entity (Warren, 1971), although membership typically is smaller than the actual population within that geographic area. Villages capitalize on community assets to achieve a shared vision among members and volunteers of older adults’ value to the community and the fundamental nature of interdependence and civic engagement. For example, many Villages offer opportunities for community engagement, such as potluck dinners, book clubs, and educational programs on relevant topics. Villages also focus on external forces affecting a community and often become leaders in advocating for better services and resources by highlighting the gaps and fragmentation in formal service systems. Within this community practice frame, the Village model emphasizes an empowerment philosophy that focuses on participation and competence building at the individual and community level (O’Melia, Miley, & Dubois, 2004). Members lead the program and serve other members. Villages focus on enabling members to make choices about their support needs, thus preventing deterioration that might erode personal autonomy. Village initiatives are uniquely compatible with social work practice values. Most functioning Villages have, at a minimum, an executive director to coordinate services and day-to-day operations, but a Village also may employ social workers, volunteer coordinators, or other administrative staff. The Village’s focus is empowerment, having community members determine the program structure and the services offered. Therefore, beyond the traditionally recognized skills, such as administrative, development, and evaluation, social workers act as facilitators, organizers, educators, brokers, and advocates. They assist with community capacity building and need/asset assessment, and provide bridging capital. The Village social worker mainly acts as a community organizer, identifying assets and supporting capacity building, community investment, and mutual exchange. The social worker’s ongoing role is to foster among area residents a sense of commitment to the Village community. This requires advanced communication and relationship-building skills, as new members and volunteers must continually be recruited and buy into the worldview to sustain the Village community. The social worker, at times, may act as an educator, providing information to Village members, community residents, and external entities. Another dominant social work function in Villages is bridging capital and connecting community members with needed resources and support by recruiting volunteers and vetting external providers (Weil, 2005). Social work brokering skills are well suited for performing this function within Village programs, including garnering member discounts from vendors. 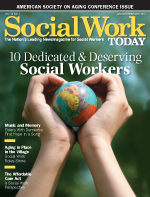 Social workers bring a wealth of knowledge regarding health, social, and economic systems and can act as a resource for members, connecting them with other service systems when necessary. Because empowerment and person-centered approaches are central to their training, social workers proactively engage members and their families as partners. Ongoing coordination of services is vital in preventing deterioration in health or functional status. For example, the Village often becomes the natural coordinator among various agencies. Social workers manage this coordination by facilitating communication, assessing need, and identifying services in partnership with a member. Care coordination also provides the opportunity for social workers to educate members on available Village and external services and to assure that all needs have been addressed. Social workers are trained to administer comprehensive biopsychosocial assessments. In the Village model, the goal of such assessments is twofold: to help members understand and partialize their challenges, and to plan for future need. In addition, members and volunteers are evaluated with regard to their strengths, identifying resources they can share with other members. Social workers facilitate community-level assessments, incorporating elements of social planning and community development into their role (Rothman; Weil). Village social workers advocate for members at both the clinical and policy levels. At the clinical level, social workers help clients to advocate for their care preferences, which often involves educating members and their families regarding care and end-of-life options, helping members to communicate their choices, and discussing with family members how these options can be safely executed. Also, the Village serves as an ombudsman for its members when navigating the healthcare system, communicating with physicians and other healthcare providers. At the macro level, Village social workers and members together advocate with state and local leaders, social service agencies, and healthcare facilities to increase services for members. Often Village social workers advocate for a more comprehensive continuum of care in the community that affords Village members a variety of options to remain in the community. This may include establishing long term care facilities in the neighborhood or assuring access to primary care practices. Village social workers help represent members’ needs with local political officials in making communities more age and disability friendly with, for example, the inclusion of universal design in new construction and accessible neighborhoods. Because Villages offer social workers the opportunity to redefine their traditional roles in long term care, this novel organizational model presents social workers with unique challenges. At the core of Villages’ mission is relationship building between volunteers and members, which encourages friendships and attachments, and ultimately increases mutual self-worth. Simultaneously, members and volunteers have boundaries that are unique to each individual. An unhealthy dependency on a member’s part may lead to volunteer burnout, which diminishes a volunteer’s capacity to help in the future. Likewise, a volunteer’s overinvolvement may threaten a member’s autonomy and personal empowerment, and thwart his or her desire to request future services. Also, Villages rely on confidentiality as a tool to encourage members to request services and form trust with the community. Therefore, breeches of confidentiality may impede the relationships between members and volunteers, and also can become barriers to requesting assistance. Social workers are tasked with responding at both the organizational and individual level to address these challenges. At the organizational level, social workers can collaborate with leaders and members to develop policies and procedures, and implement the best practices that address the maintenance of appropriate boundaries and confidentiality. Additionally, they must work at the individual level to help members and volunteers define and communicate boundaries in a person-centered manner. They can help build critical consciousness by training volunteers on the role of confidentiality in empowering the member to request services, reducing unhealthy dependency, and fostering reciprocal relationships that bolster feelings of dignity, self-efficacy, and mutuality. Although the most successful Villages have risen from the community itself, social workers must continually galvanize support from the community. During the organization’s formation stage, social workers partner with Village initiators to educate the community on the health and long term care systems, and the organization’s response to service gaps. It’s crucial to identify and recruit interested and invested community members to actively participate in the program’s design. Community buy-in also is essential to develop the organization’s membership, largely because most Villages rely significantly on membership dues for funding. Social workers must be able to clearly communicate the Village’s role, purpose, and function within the community and execute a creative, person-centered approach to help potential members determine how the Village can help them. Likewise, the need for an adequate number of volunteers and a range of volunteer skills requires ongoing education and raising consciousness to encourage community residents and members to share their skills and talents to support the Village members. Because members do not have a vesting period prior to receiving services, Villages often find members who join only when they experience a crisis, requiring immediate services. Social workers and Village leaders must work to communicate and demonstrate why it is important for members to invest in membership benefits prior to such crises. Expanding the model into low- and moderate-income communities is a critical challenge for social workers. Reliance on membership dues to support infrastructure and coordinate services is problematic. In lower-income communities, the dues would have to be subsidized or services scaled back to sustain a Village. Likewise, reliance on volunteers may be more challenging in lesser endowed or historically disempowered communities. Social workers need to focus on building external support from public and private sources to expand these initiatives. Social workers also face challenges in conducting research and using findings to improve Village practices and long term care policy. Because the Village model is in the developing stage, there is a lack of research on its efficacy. The impact of Village services on long term care outcomes, such as premature institutionalization, quality of life, overall health, or cost-effectiveness, is not well understood. A better understanding will help Villages build a case for policy changes at local, state, and federal levels, including access to funding to subsidize Village programs in low-income communities or for additional in-home support services. Additionally, the impact of Villages at the community level, including their ability to build a sense of community, increase civic engagement, enhance personal and interpersonal empowerment, increase social capital, and engage the leadership of older adults, is not well understood. It’s necessary to determine the impact of a volunteer-first model, which includes the benefits to volunteers and members alike. This research is vital to conclude whether Villages are meeting the goals set forth in the model’s mission. Not all aspects of aging in place can be addressed via volunteer services or at the community level. Not all older adults will choose to remain in a particular community, so a continuum of options is needed. We are not proposing a devolutionary response to long term care services, whereby the community becomes the focal point and main provider of services. Rather, we are suggesting that Village initiatives have a role in supporting aging in place by expanding access to critical resources within communities and raising awareness of the need for long term care. The rapidly growing Village movement has presented a new community-based service medium for older adults who choose to age at home. Social work’s practice philosophy is particularly compatible with the empowerment and community-focused philosophy of the Village model. Note: A more detailed discussion of the Village model can be found in the authors’ article “It Takes a Village: Community Practice, Social Work & Aging in Place,” published in the Journal of Gerontological Social Work (2011, 54(5), 528-541). — Katie McDonough, MSW, LICSW, is executive director of Capitol Hill Village in Washington, DC. — Joan K. Davitt, PhD, MSS, MLSP, is an associate professor and the Hartford Geriatric Faculty Scholar in the School of Social Work at the University of Maryland, Baltimore. O’Melia, M. W., Miley, K. K., & Dubois, B. L. (2004). Generalist social work practice: an empowering approach. 4th ed. Boston: Allyn and Bacon. Rothman, J. (1995). Approaches to community intervention. In J. Rothman, J. L. Erlich, J. E. Tropman (Eds. ), Strategies of community intervention. 5th edition. (pp. 26-63) Itasca, IL: F. E. Peacock. Warren, R. L. (1971). The community in America. 2nd ed. Chicago, IL: Rand McNally. Weil, M. (2005). Introduction: Contexts and challenges for 21st century communities. In M. Weil (Ed. ), The handbook of community practice. (pp. 3-33). Thousand Oaks, CA: Sage Publications.